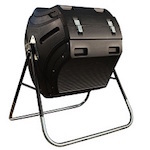 Product: Lifetime Products Outdoor Yard Equipment - Compost Tumbler - Shipping Included! Take better care of your local environment by creating your own compost to fertilize your garden. No more spending money on artificial fertilizers; just let mother nature do the work for you. This tumbler is made with black, double-walled panels that absorb and retain the heat necessary to decompose organic material as well as an internal bar to mix and break down the material into a rich, black organic fertilizer for your garden. 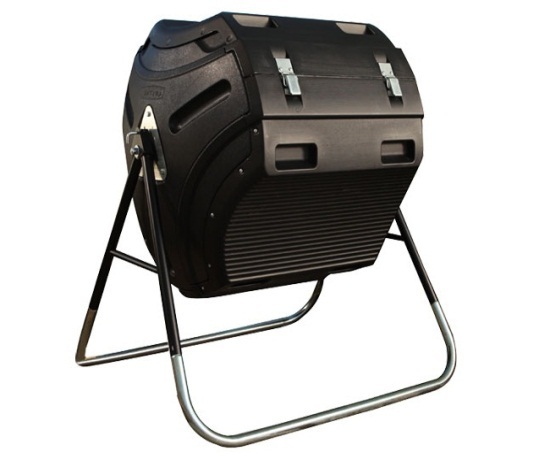 The tumbler has a spacious 75 gallon capacity and easily turns on its axis for balanced rotation. 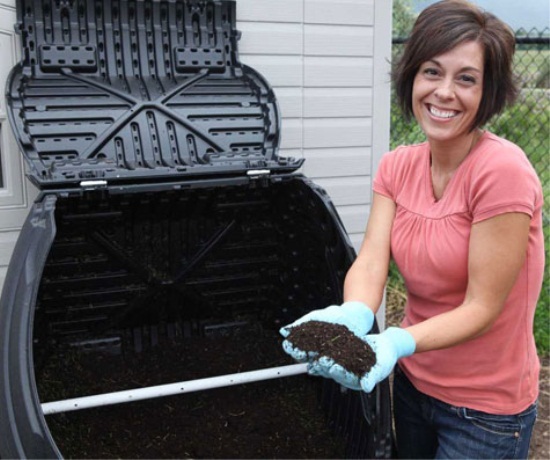 With a compost tumbler you can easily reduce, reuse, and recycle kitchen and garden waste into a rich organic soil conditioner. Approx. weight of unit without any compost is 65 lbs. Tumbler capacity of 75 gallons / 10 cubic feet. Unit comes with a factory 5 year limited warranty. Very easy to do business with. Tumbler works great. I really like this! It is great quality plastic. I was able to put it together with my sister in about 30 minutes. I did have a problem with attaching the "self tapping screws" into the base, but I found out there were supposed to be two holes, but they were not there. I was still able to put it together even without those attached because the weight just hold it together. I really like how it works easy to open and close and turn. I purchased 2 units for a Co-op complex and they love the units. I would love the see a lock on the unit. I am very satisfied with this item. went together with no problems, shipping was fast. Thank you. I have 2 of these units. 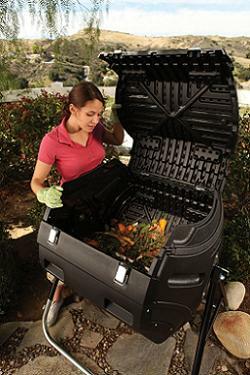 It takes some work to assemble a unit, and although the instructions are reasonable, they need a little more details for someone who does not do a living making compost. Needs instructions on how it works, recommendations what to add, how to best make the tumbler rotate without injuring your fingers, and finally what to expect. There is a hollow rod/axis with holes to apparently allow to breath the compost through the sides, but it came out loose after 1 year of use, so I suggest to create a way of fasting that rod, since I am afraid now, this is the beginning of the unit becoming apart. One of my units has more than 2 years and several of the metal pieces are already rust. I would recommend wearing heavy duty gloves and rubber boots at the time of filling the tumbler, particularly during rainy days. The smell can very strong at the time of opening the unit, particularly in summer, so wearing an air filter to breath while doing the loading adds to the comfort. I have been adding remnants of fresh vegetables and fruits, almost 3 times a week, for more than 1 year, and I keep adding stuff and it does not fill, which for me is sufficient in not adding to my weekly garbage and for the feeling that I am recycling. But I don't get any compost! All the solids remain in the tumbler, so I will say the unit fulfills the purpose of not adding to the trash/garbage, but I have lost my expectation of getting some new dirt for my garden. It works better than the other compost tumblers that I've used and has held up well, but I'm unsure if that justifies the price. Q: Small "pin" which holds back or retains the locking pin on one of my three tumblers has snapped off after years of use. How do I repair/replace this or the whole locking mechanism? Can't seem to find parts. A: For replacement parts you will need to call 1-800-225-3865. Q: Will the hinges rust, and if they do, how can I get replacements? A: The hinges should not rust. If they do their are available replacement hinges-likely covered under warranty anyway. Feel free to contact us with any other questions. 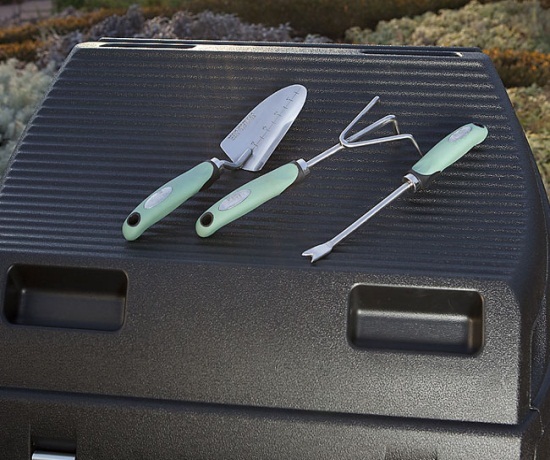 Q: What is the "recipe" for good compost? A: The exact recipe for compost, would need to be researched online. You need to add lots more "brown" ingredients such as old leaves and dirt then you do "green" ingredients such as kitchen scraps. The ratio is around 20 : 1. For more detailed instructions, please search on the web. Q: I was wondering if the bar on the inside of it can be removed? A: The bar inside cannot be removed; otherwise, it would not be able to spin. Feel free to contact us with any other questions. Dimensions: 48" x 40" x 12"